As part of our menu projects, we were required to include a short essay on an ingredient or component used in one of our dishes. I knew right away that I had to write on the arepa, as there really is no more popular Venezuelan food. The arepa is a major staple in the Venzuelan diet and it is probably the country’s best known dish. Venezuelans eat them with breakfast much like an English muffin, as a sandwich at lunch, as a side at dinner, and a million of other ways in between. In its most basic form, the arepa is a round, rustic bread or griddle-cake usually made from corn flour that can be fried, grilled, baked, or cooked with a combination of methods. The two most common preparations in Venezuela are probably the arepa frita, which is deep fried, and the arepa asada, which is first grilled or pan-fried, and then finished in the oven. Beyond these basic versions, however, there are countless variations. Cheese and other flavoring may be added to the dough, and sweet versions exist as well. In some regions, eggs or milk are added to the dough, and different types of corn may be used. 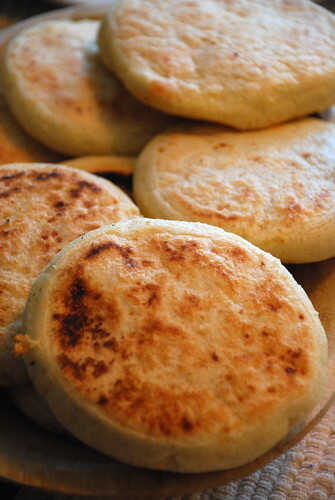 Arepas are also widely eaten in Colombia, often in a form very similar to the Venezuelan asada, but it is usually wider and flatter, and the resulting cake is a bit drier. Another Colombian variant that is a particular favorite is the arepa de huevo. In this version a raw egg is enclosed in the middle of the uncooked arepa and the whole thing is deep fried together. Nowadays, making arepas is far simpler and takes no more time than preparing pancakes thanks to the introduction of pre-made corn flour, which has already been peeled and boiled. All that is required is the addition of salt, water, and any other desired flavorings, and within a couple of minutes the arepa dough is ready to be formed into patties and cooked according to preference. In addition to using it to make arepas, Venezuelans use this flour for many other applications as well. For example, the dough can be stuffed with fillings prior to cooking to make the Venzuelan version of the empanda. During the holidays, it is also used to prepare a traditional dish called hallacas, which is similar to the Mexican tamale. You really can’t go too far in Venezuela without running into an arepa or its cousins. They are sold at panaderias and areperas everywhere throughout the country and given the countless ways it can be prepared, there is really an arepa for everyone.